Patio Covers in Boerne, range from large to small, standard to Extravagant. When we build your Patio Cover, we build it to last! 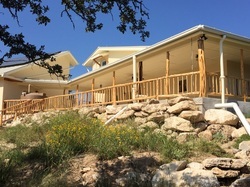 At Boerne Deck Builder, we always begin by giving you a FREE Estimate. This allows for us to discuss with you what details and specifics you are looking for in your Covered Deck or Patio. With the No Obligation FREE Estimate, we can also talk about Financing Options. We are all on a budget these days, and don't expect our customers to have to pay outrages prices. Once approved, we begin Designing your Patio Cover. Our Creative Team of Designers and Builders will put it all on paper so that you can view the blueprints. Our more complex builds will sometimes be designed using computer software. During the planning stage, we also sit with you and determine the best wood to use for your project. After the blueprint plans are approved, we get to work, building you your Dream Patio Cover. We always complete our work with your choice of a beautiful coat of stain or paint, whichever you choose. Finally, our job is not complete until you are 100% Satisfied. If there are any changes, alterations, or missed areas we need to address, we ask that you not hesitate to let us know. - We want you to be happy with your backyard, but also, the job we do reflects our Business Guidelines. So we make sure no corner is missed, and no edge is overlooked. A Patio Cover provides wonderful shade during the warm months and protection during the rainy seasons. You can enjoy the outdoors anytime of the year with a Patio or Deck Cover from Boerne Deck Builders. Contact us anytime at (830) 428-2999 or shoot us an email using the form on the right. We look forward to talking to you!